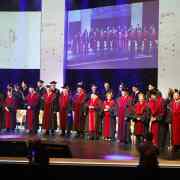 In a dazzling ceremony held during the 2018 Board of Governors Meeting, Tel Aviv University conferred its highest distinctions upon nine exceptional laureates. They included a leading journalist, a former president and a cultural icon alongside successful businessmen, noted philanthropists and pioneering scientists. 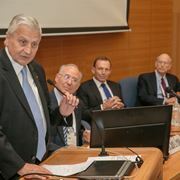 The ceremony was held in the Miriam and Adolfo Smolarz Auditorium in the presence of senior TAU officials and academics, Governors and friends, members of the diplomatic corps, and other guests. TAU President Joseph Klafter congratulated the award recipients, who have “infused their fields with creativity and expertise, whether in academia, business, culture or civic life. Tenacious and inventive, our honorees have overcome obstacles to forge paths of remarkable accomplishment. 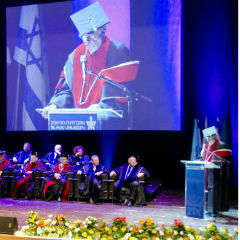 They represent everything that Tel Aviv University stands for, and that we teach our students,” he said. “Never give up, always keep trying” Mr. Ma told attendees in his acceptance speech, which was delivered on behalf of all the honorees at the ceremony. “This motto reflects both Israel’s and Alibaba’s success. Coming to Israel was a dream I had for many years. I should have been here earlier. People should not read about Israel, they should come here, feel it and touch it. To me, Israel represents wisdom, innovation and persistence,” he enthused. ​Dmitry Zimin is a professor of engineering at the State University – Higher School of Economics in Moscow. He holds a PhD in technical sciences from the Moscow Aviation Institute and, for over 35 years, held various leadership roles at the military-industrial Mintz Radio Technical Institute. Zimin is the former CEO and current Honorary President of mobile telecommunications company VimpelCom. He founded the Zimin Institute for Engineering Solutions Advancing Better Lives at TAU and previously launched a project at the TAU law faculty in support of Israeli-Russian student exchange and the study of Russian law. He was recognized his “exceptional accomplishments as a scientist, inventor, businessman and philanthropist; his entrepreneurial prowess in founding and directing the VimpelCom mobile telecommunications company; and his profound belief in the power of education and the creation of the first NGO supporting basic science and education in post-Soviet Russia.” Since Dr. Zimin was unable to attend the ceremony, his son, Boris, accepted the award on his behalf.